A few clouds. Low 59F. Winds ESE at 5 to 10 mph..
Alice Oldford’s “10 Adventures and More in Lee and Collier Counties: Florida on Land and Water” recently won a Gold Medal from the annual 2018 Florida Authors and Publishers Association President’s Book Awards. 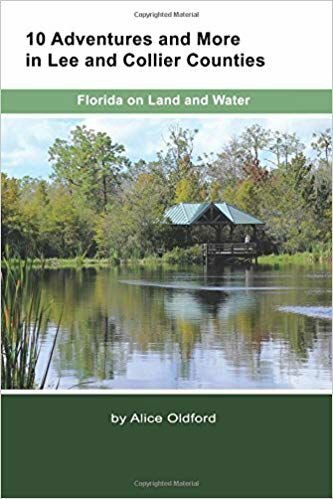 LAKE BUENA VISTA — The Annual 2018 Florida Authors and Publishers Association President’s Book Awards recognized “10 Adventures and More in Lee and Collier Counties: Florida on Land and Water” by Alice Oldford, in the category of Sports and Recreation, as a Gold medal winner. “10 Adventures and More in Lee and Collier Counties: Florida on Land and Water” is a non-fiction book, published by Create Space, which invites readers to enjoy an active outdoor experience in bustling Lee and Collier Counties while also learning some local history. How did the Monday Group, a bunch of 1970s teenagers, influence development of Six Mile Cypress Slough Preserve and Manatee Park? This book was almost derailed by Hurricane Irma, but Mother Nature has healed the wounds and offers great adventures right in our own back yards.